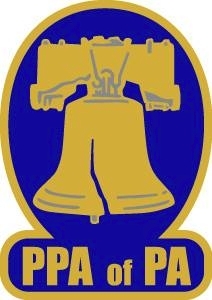 The Golden Bell pin is awarded to those who actively participate in events held throughout the year by the PPA of PA. Events are given point levels in varying amounts, and when a member reaches a total of 200 points, he is awarded a Golden Bell pin at the next Annual Awards Banquet! Points are submitted at the end of the year using the provided form. 50 Points Join as a new member, or rejoin after a lapse in membership. 30 Points Sponsor a new PPA of PA member. 20 Points Pay renewal dues by January 1st. 10 Points Bring a prospective member to an event. 35 Points Attend all three days of INSPIRE Annual Convention. 20 Points Attend two days of INSPIRE Annual Convention. 10 Points Attend only one day of INSPIRE Annual Convention. 20 Points Attend the Annual Awards Banquet. 35 Points Attend all three days of Capture. 20 Points Attend two days of Capture. 10 Points Attend only one day of Capture. 15 Points Present a program at a First Thursday Meeting. 10 Points Attend a First Thursday meeting. 15 Points Compete in the summer print competition. 15 Points Compete in the Capture print competition. 20 Points Attend a full-day special education seminar. 15 Points Attend the summer picnic. 10 Points Attend the holiday party. 10 Points Have an original non-recurring article published in the PPA of PA Newsletter (limit one per issue). 5 Points Tweet, share on Facebook, or other social media to promote PPA of PA event (5 point limit for each month). Requires 16 state merits through print and album competitions. Each blue-ribbon print, album or digital image at our Annual Print Competition receives 1 merit or any other print competition that the Board of Governors deems worthy of merits. An additional merit is awarded for each trophy won at the annual Print Competition. For every 16 additional merits in competition after receiving the medallion, you receive a gold bar. Requires 16 state merits through service on committees and continued membership. You will receive service merits for serving on various committees (eg. print committee, registration, party, membership, fundraising, etc.). You will receive Service Merits for serving on the Board of Governors or holding an executive office. Service merits are awarded as either full points or fractions of points depending upon the decision of the committee chairman as to how much you contributed to the committee work. You also are entitled to a .5 point for each year you are a member in good standing. In order to receive credit for any service merits (even membership merits) you must complete and return the application for service merits form that comes out in October. After receiving 16 service merits, you will receive the silver Service Award medallion at the next awards banquet. For each additional 16 service merits after receiving the initial medallion you receive a gold bar.